Caerfai Farm Camp Site is located just a short stroll away from the centre of the UK’s smallest city, St Davids. 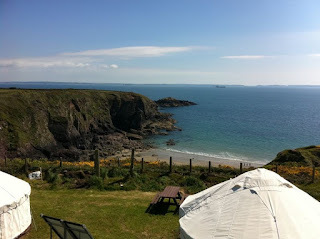 It is situated in the heart of the beautiful Pembrokeshire Coast National Park, right above Caerfai Bay. Facilites at the campsite include: Water standpipes within 100 metres of every pitch, a service building including toilets, hot showers, hair dryers, shaver points and refuse and chemical toilet disposal points. There is a laundry room at the farm (100 metres from site) and this has coin operated washing machines and dryer plus hand wash facility and spin dryer. The farm shop sells basic essentials and organic produce, including cheese made from the cows’ milk on the farm. Just 10 minutes’ walk away is the city of St Davids with its majestic Norman Catherdral, Bishop’s Palace, galleries, shops, restaurants and pubs. Caerfai is also an excellent base for coast walking, with the route to Porthclais described as one of the most fascinating sections of the Pembrokshire coast path.